First an update: We have finished the text of the book and have been going through editing, correcting and reorganizing while Steve works on the layout. The good news is that the raw text of the book is over 140 pages (without pictures, breaks, etc). This is going to be a book that you will be able to dive into with abandon. The early readers have described the tone as “conversational but deeply informative” - which is pretty much exactly what we were going for (hooray). There are some things that are taking a little longer then planned. The book is a little more wordy then we originally thought so editing, reading, etc is pushing the timeline back a little. Additionally we’re trying to specify all the measurements in weight (grams) as well as volume (cups) and its taking a little while to re-test and re-measure all the recipes. This is a good thing though - this book will be very accurate and hopefully easy regardless of where you live. Our friend Chris Muscarella and his brother, Stephen, just launched a KickStarter last week that is (rightfully) getting a lot of attention: The Field Skillet. We’re so excited to get our hands on one - though we’ve only experimented with using cast iron for pizza, the smooth surface and lightness of the Field Skillet seems like it could be an exciting way to cook pies. 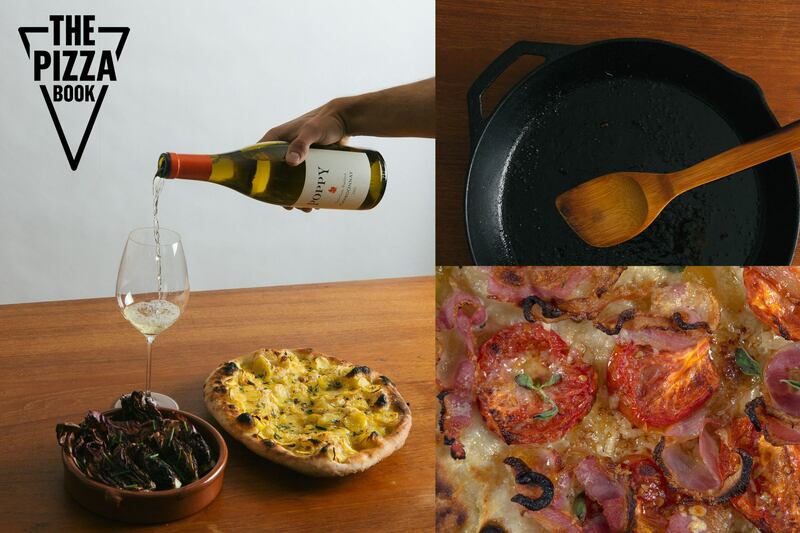 Regardless of the actual pie potential, The Pizza Book has a ton of recipes that rely on cast iron to create some of the flavors we love: char and caramelization. We never expected to be wowed by a salad at a pizza joint, but then we tried the Green Goddess salad at San Francisco’s Little Star, a Chicago-style deep dish pizza place. They serve some really great deep dish pizza, but their Green Goddess salad is the standout dish. Crisp fresh Little Gem lettuce gets dressed in a zippy and herbaceous green dressing. For our salad, we decided to use smoky charred lettuce as our base, with spicy radishes added to the mix. 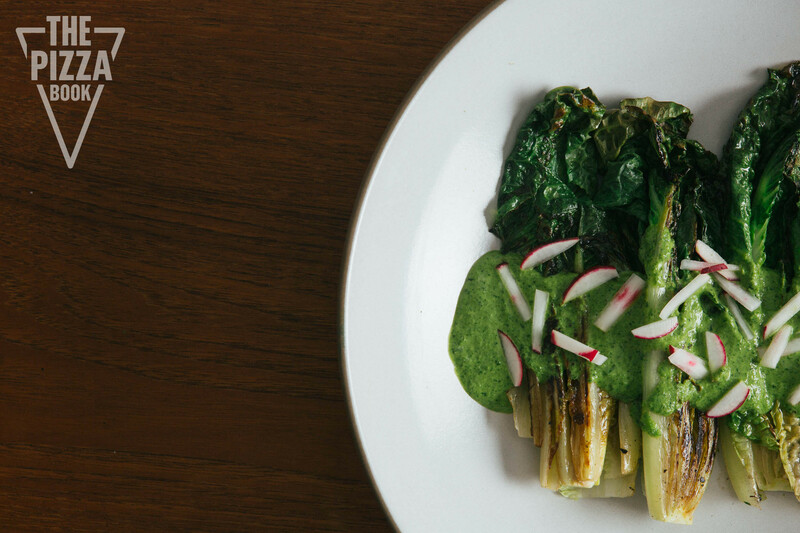 Instead of a classic Green Goddess dressing ours is more of a green sauce that is inspired by a sauce served at one of our favorite New York Cuban restaurants, Sophie’s. This salad is simple and refined. The small touches make it special, and it’s easy to make this year round as long as you can get your hands on fresh herbs. Clean the lettuce keeping the entire hearts intact. Remove two outer leaves and set aside. Slice the hearts in half lengthwise. Using a blender or immersion blender combine the oils, the two lettuce leaves, onion, herbs, half of the lemon juice, and salt. Blend until smooth. Taste for salt and acid, and adjust with more lemon juice and/or salt if needed. This dressing can be made several hours prior to serving. Taste again before plating. Slice the radishes into thick slices and then cut them into batons. Heat a cast iron pan over very high heat and place the lettuce halves cut-side down. Cook until the sides seem slightly wilted and the cut sides are well browned, about 3 minutes. Use a thin metal spatula to transfer to a large plate cut side up. Spoon the green sauce over the lettuce, top the lettuce with radish, and then drizzle the dish with another drizzle of olive oil. Serve warm or at room temperature.